I'm fairly new to the saltwater hobby. I have been keeping freshwater planted tanks for about a decade now, but I realize that saltwater aquariums are a little bit more involved. My tank is a FOWLER and established, but I would like to upgrade my lighting so I can get some corals and maybe a BTA eventually. Right now I only have PC lights. I'm going to keep them and add four T5 54w HO bulbs. That equates to 476 w (PC lighting: 65 x 4= 260; 54 x 4= 216) over a 90 gallon tank means that I'll have 5.28 watts per gallon. From what I've read, PC lights don't penetrate as deep as other lighting types, so I would keep the PC's at the back, where the rock work is nearly to the surface of the water. Then the T5 lights would be the front half. Is there any problem with that? I was thinking that some lower light corals could be placed lower on the rock work and would be covered with T5 lights. If I were to eventually get a BTA, it would be placed higher up where it would get a mix of T5 and PC lights. Again, can anyone see if that would be a problem? Now here comes the actinic issue: I've been reading numerous conflicting statements about them. Some say that they are worthless and only used to enhance certain colors in a saltwater aquarium while others say that they are vital to coral growth since they penetrate into the water deeper than 10,000K bulbs. I began researching this because I need to replace my PC bulbs right now and I want to get 50/50's, but not if only using 10,000K will be more beneficial. The same goes for the T5 lights, I don't want to get two bother with getting two actinics along with the 10,000K if the actinics aren't useful. 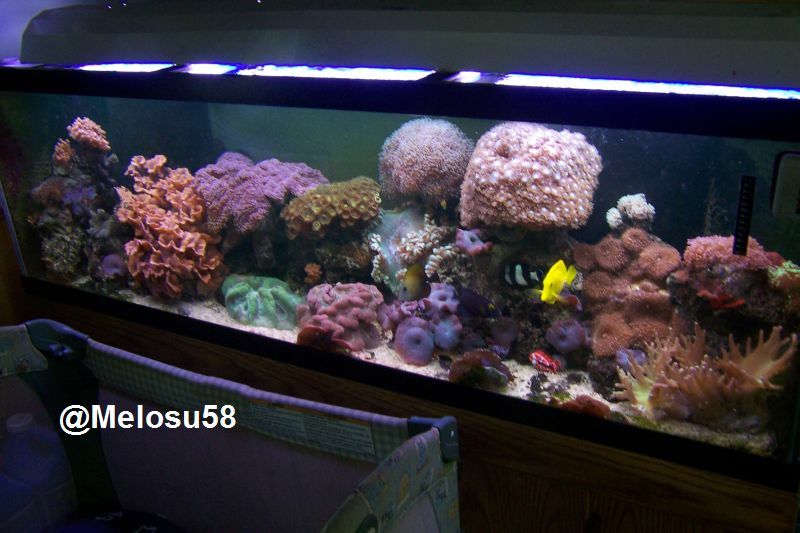 I know from personal experience that the actinics make a huge difference in the appearence of the corals. I don't know how they affect coral growth. I may not be correct on this one, but i'm pretty sure that madaniel is correct in the fact that they do NOT affect coral growth. I've only heard that it gives coral that extra pop that really make their colors extremely vibrant. While not being required, i find that they are definitely well worth it since they are fairly low cost and they give the tank an extremely nice look. I mean, once you get past the expense of the fixture itself, the actinic bulbs are around 12$ which is nothing compared to Power Compact bulbs, or Metal Halide bulbs. I personally think that actinics are important. The part of the spectrum that penetrates to the reefs is blue. That`s why I use 2 bulbs of actinic and 2 bulbs that are 50/50. My coral growth kind of proves that actinic lighting is not worthless . But do you think that if you didn't have the actinics you would lose coral growth? Or you would see no effect? Most of the coral books I've read say that the pure actinic bulbs are definitely not worthless, and definitely do more than just make the coral colors pop. Actinic Watts are just as useful as Daylight Watts. If they weren't, then my 46g tank would only have 96W, and I'm keeping medium-light SPS just fine, thank you. ...while others say that they are vital to coral growth since they penetrate into the water deeper than 10,000K bulbs. ...is close to my understanding of it.The actinic focuses its energy into the wavelength of light that the corals "see" at their normal depths in the ocean. Thanks for the input everyone. I'm pretty sure I'll order some actinic bulbs for my PC lights as well as when I purchase my T5 fixture. Not only are they aesthetically pleasing, I believe they do in fact help corals, especially in a deeper aquarium. Until I find definitive proof that shows an improvement in growth rates and overall health between the same species of coral using only 10,000K bulbs, I'm going 50/50. Does anyone know the best bulbs to get in terms of wavelength? I believe that they are measured in nanometers. Melosu58 and Kurt, I guess the proof is in the pudding. Not that this is 100% proven, but I doubt that either of you would have such beautiful corals if actinics were worthless. Zero, you do bring up an interesting point. Lets say that the actinics were replace with regular lights, would there be any change in the growth of the corals (more, none or less)? If there was an improvement, I certainly would be tempted to switch to all daytime bulbs. But if the coral growth remained the same regardless of switching to all daytime bulbs, I personally would stick with half actinics because I like how they affect the coloring. If there was less growth, obviously I would keep my actinics. I'm sure some study is out there where somebody experimented with corals under certain lights. This is my set up as I said it`s 2 super actinic and two 50/50`s. I run VHO`s BTW. Also how my tank looks with that kind of set up. "Corals flourish between 400nm-700nm (not macro algae), so providing lighting in this range would be your goal . . .
keep in mind that photosynthetic efficiency peaks at around 430 nanometers which is very close to the major spectral output of a standard “actinic” bulb."